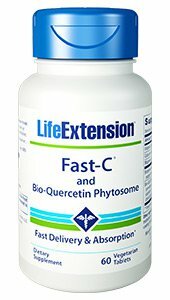 Fast-C and Bio-Quercetin Phytosome: Vitamin C supports your immune system as well as whole-body health. Fast C® and Bio-Quercetin Phytosome is a unique vitamin C supplement augmented with Bioperine® black pepper extract, an ultra-absorb-able form of quercetin, and a unique calcium-magnesium mineral complex. Fast C® maximises the absorption and health benefits of vitamin C supplementation. Vitamin C is a potent antioxidant with profound whole-body health benefits. This essential nutrient supports immune health, heart health, iron uptake, collagen formation, and more. Plus, research indicates that people with higher vitamin C levels are more likely to live longer, healthier lives. Quercetin has a long tradition of use relieving the effects of seasonal immune challenges, and has been shown in clinical trials to encourage a healthy immune response in physically fit adults. Quercetin helps inhibit oxidative stress and inflammation. Quercetin also promotes both cardiovascular and endothelial health and helps maintain healthy blood pressure already within the normal range. Plus, quercetin complements vitamin C’s whole-body health benefits. And our innovative bio-quercetin ingredient in this supplement is encased in a phytosome, or a tiny phospholipid sphere that makes it up to 50 times more bio-available than traditional quercetin. Our Fast C® formula also contains calcium and magnesium to neutralise acid. This makes Fast C® the ideal vitamin C supplement for people with acid-sensitive stomachs. Piperine is a substance found in black pepper that augments the absorption and bio-availability of nutrients like vitamin C. Get the most out of your vitamin C supplement. Try Fast-C® and Bio-Quercetin Phytosome today! Other ingredients: microcrystalline cellulose, stearic acid, maltodextrin, croscarmellose sodium, vegetable stearate, silica, coating (hydroxypropyl methylcellulose, glycerin). Fast-C® is a registered trademark of Scientific Food Solutions, LLC.